An alternator is an electromechanical device that converts mechanical energy to electrical energy in the form of alternating current. Most alternators use a rotating magnetic field but linear alternators are occasionally used. In principle, any AC electrical generator can be called an alternator, but usually the word refers to small rotating machines driven by automotive and other internal combustion engines. Alternators in power stations driven by steam turbines are called turbo-alternators. Alternating current generating systems were known in simple forms from the discovery of the magnetic induction of electric current. The early machines were developed by pioneers such as Michael Faraday and Hippolyte Pixii. Faraday developed the "rotating rectangle", whose operation was heteropolar - each active conductor passed successively through regions where the magnetic field was in opposite directions. The first public demonstration of a more robust "alternator system" took place in 1886. Large two-phase alternating current generators were built by a British electrician, J.E.H. Gordon, in 1882. Lord Kelvin and Sebastian Ferranti also developed early alternators, producing frequencies between 100 and 300 Hz. In 1891, Nikola Tesla patented a practical "high-frequency" alternator (which operated around 15 kHz). After 1891, polyphase alternators were introduced to supply currents of multiple differing phases. Later alternators were designed for varying alternating-current frequencies between sixteen and about one hundred hertz, for use with arc lighting, incandescent lighting and electric motors. Alternators generate electricity by the same principle as DC generators, namely, when the magnetic field around a conductor changes, a current is induced in the conductor. Typically, a rotating magnet called the rotor turns within a stationary set of conductors wound in coils on an iron core, called the stator. The field cuts across the conductors, generating an induced EMF, as the mechanical input causes the rotor to turn. The rotating magnetic field induces an AC voltage in the stator windings. Often there are three sets of stator windings, physically offset so that the rotating magnetic field produces three phase currents, displaced by one-third of a period with respect to each other. The rotor magnetic field may be produced by induction (in a "brushless" alternator), by permanent magnets (in very small machines), or by a rotor winding energized with direct current through slip rings and brushes. The rotor magnetic field may even be provided by stationary field winding, with moving poles in the rotor. Automotive alternators invariably use a rotor winding, which allows control of the alternator generated voltage by varying the current in the rotor field winding. Permanent magnet machines avoid the loss due to magnetizing current in the rotor, but are restricted in size, owing to the cost of the magnet material. Since the permanent magnet field is constant, the terminal voltage varies directly with the speed of the generator. Brushless AC generators are usually larger machines than those used in automotive applications. More generally, one cycle of alternating current is produced each time a pair of field poles passes over a point on the stationary winding. The relation between speed and frequency is N = 120f / P , where f is the frequency in Hz (cycles per second). P is the number of poles (2,4,6...) and N is the rotational speed in revolutions per minute (RPM). Very old descriptions of alternating current systems sometimes give the frequency in terms of alternations per minute, counting each half-cycle as one alternation; so 12,000 alternations per minute corresponds to 100 Hz. 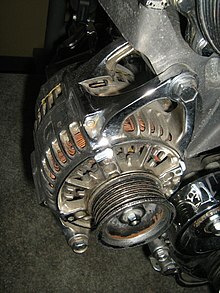 Alternator mounted in lower right front of an automobile engine with a serpentine belt pulley. Cut-away of an alternator, showing the claw-pole construction; two of the wedge-shaped field poles, alternating N and S, are visible in the center, and the stationary armature winding is visible at the top and bottom of the opening. The belt and pulley at the right hand end drives the alternator. Alternators are used in modern automobiles to charge the battery and to power a car's electric system when its engine is running. Alternators have the great advantage over direct-current generators of not using a commutator, which makes them simpler, lighter, less costly, more rugged than a DC generator, and the slip rings allow for greatly extended brush life. The stronger construction of automotive alternators allows them to use a smaller pulley so as to turn faster than the engine, improving output when the engine is idling. The availability of low-cost solid-state diodes from about 1960 onward allowed car manufacturers to substitute alternators for DC generators. Automotive alternators use a set of rectifiers (diode bridge) to convert AC to DC. To provide direct current with low ripple, automotive alternators have a three-phase winding. Typical passenger vehicle and light truck alternators use Lundell or claw-pole field construction, where the field north and south poles are all energized by a single winding, with the poles looking rather like fingers of two hands interlocked with each other. Larger vehicles may have salient-pole alternators similar to larger machines. The automotive alternator is usually belt driven at 2-3 times the engine crankshaft speed. Automotive alternators are not restricted to a certain RPM because the alternating current is rectified to direct current and need not be any constant frequency. Modern automotive alternators have a voltage regulator built into them. The voltage regulator operates by modulating the small field current in order to produce a constant voltage at the stator output. The field current is much smaller than the output current of the alternator; for example, a 70-amp alternator may need only 2 amps of field current. The field current is supplied to the rotor windings by slip rings and brushes. The low current and relatively smooth slip rings ensure greater reliability and longer life than that obtained by a DC generator with its commutator and higher current being passed through its brushes. Where the brushes in a generator are relatively accessible for service and replacement, the alternator's brushes are not. The alternator usually must be disassembled to reach and change the brushes. However, the smooth slip rings cause so little brush wear that they may be said to last the life of the alternator. Efficiency of automotive alternators is limited by fan cooling loss, bearing loss, iron loss, copper loss, and the voltage drop in the diode bridges; at part load, efficiency is between 50-62% depending on the size of alternator, and varies with alternator speed. In comparison, very small high-performance permanent magnet alternators, such as those used for bicycle lighting systems, achieve an efficiency around 60%. Larger permanent magnet alternators can achieve much higher efficiency. By contrast, the large AC generators used in power stations run at carefully controlled speeds and have no constraints on size or weight. Consequently, they have much higher efficiencies, on the order of 98% from shaft to AC output power. The field windings are initially supplied via the ignition switch and charge warning light, which is why the light glows when the ignition is on but the engine is not running. Once the engine is running and the alternator is generating, a diode feeds the field current from the alternator main output, thus equalizing the voltage across the warning light which goes out. The wire supplying the field current is often referred to as the "exciter" wire. The drawback of this arrangement is that if the warning light fails or the "exciter" wire is disconnected, no excitation current reaches the alternator field windings and so the alternator, due to low residual magnetism in the rotor will not generate any power. However, some alternators will self-excite when the engine is revved to a certain speed. The driver may check for a faulty exciter-circuit by ensuring that the warning light is glowing with the engine stopped. Very large automotive alternators used on buses, heavy equipment or emergency vehicles may produce 300 amperes. Very old automobiles with minimal lighting and electronic devices may have only a 30 ampere alternator. Typical passenger car and light truck alternators are rated around 50-70 amperes, though higher ratings are becoming more common. Very large automotive alternators may be water-cooled or oil-cooled. Many alternator voltage regulators are today linked to the vehicle's on board computer system, and in recent years other factors including air temperature (obtained from the mass air flow sensor in many cases) and engine load are considered in adjusting the battery charging voltage supplied by the alternator. Marine alternators used in yachts are similar to automotive alternators, with appropriate adaptations to the salt-water environment. Marine alternators are designed to be explosion proof so that brush sparking will not ignite explosive gas mixtures in an engine room environment. They may be 12 or 24 volt depending on the type of system installed. Larger marine diesels may have two or more alternators to cope with the heavy electrical demand of a modern yacht. On single alternator circuits the power is split between the engine starting battery and the domestic or house battery (or batteries) by use of a split-charge diode or a mechanical switch. Because the alternator only produces power when running, engine control panels are typically fed directly from the alternator by means of an auxiliary terminal. Other typical connections are for charge control circuits. A brushless alternator is composed of two alternators built end-to-end on one shaft. Smaller brushless alternators may look like one unit but the two parts are readily identifiable on the large versions. The larger of the two sections is the main alternator and the smaller one is the exciter. The exciter has stationary field coils and a rotating armature (power coils). The main alternator uses the opposite configuration with a rotating field and stationary armature. A bridge rectifier, called the rotating rectifier assembly, is mounted on a plate attached to the rotor. Neither brushes nor slip rings are used, which reduces the number of wearing parts. The main alternator has a rotating field as described above and a stationary armature (power generation windings). Varying the amount of current through the stationary exciter field coils varies the 3-phase output from the exciter. This output is rectified by a rotating rectifier assembly, mounted on the rotor, and the resultant DC supplies the rotating field of the main alternator and hence alternator output. The result of all this is that a small DC exciter current indirectly controls the output of the main alternator. An automatic voltage control device controls the field current to keep output voltage constant. Hybrid automobiles replace the separate alternator and starter motor with a combined motor/generator that performs both functions, cranking the internal combustion engine when starting, providing additional mechanical power for accelerating, and charging a large storage battery when the vehicle is running at constant speed. These rotating machines have considerably more powerful electronic devices for their control than the automotive alternator described above. High frequency alternators of the variable-reluctance type were applied commercially to radio transmission in the low-frequency radio bands. These were used for transmission of Morse code and, experimentally, for transmission of voice and music. ^ US patent 447921, Tesla, Nikola, "Alternating Electric Current Generator". White, Thomas H.,"Alternator-Transmitter Development (1891-1920)". EarlyRadioHistory.us. "Wooden Low-RPM Alternator". ForceField, Fort Collins, Colorado, USA. "Understanding 3 phase alternators". WindStuffNow. "Alternator, Arc and Spark. The first Wireless Transmitters". The G0UTY Homepage. This page was last modified on 30 April 2010 at 23:17.